This beautiful home may be small, but it is the unprecedented views that create an attractive and charming house, along with the spacious garden that is sensational. 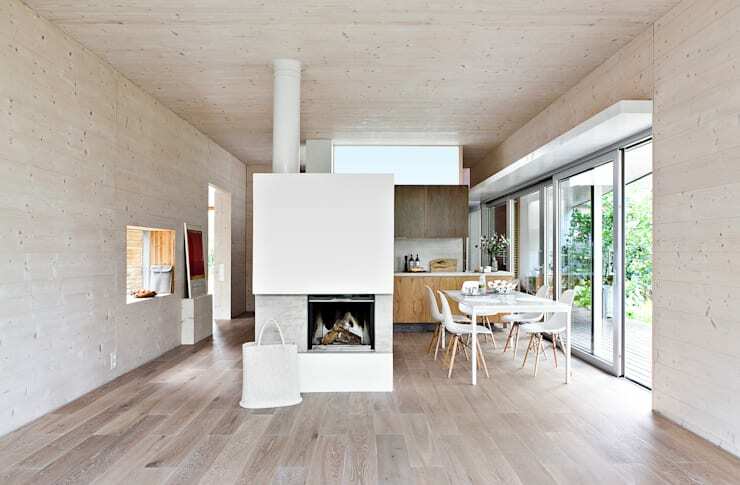 This home makes use of sustainable technology, while also being built almost entirely from wood, it is well constructed with fantastic thermal and insulating properties. The use of glass in the design ensures that natural light and heat enter the home throughout the day, while also creating a modern and sophisticated design, but let’s take a closer look! The terrace is a wooden platform that is connected to the interior of this beautiful home through a glass sliding door and has allows the sensational garden to become an extension of the home. From this space, residents can enjoy a relaxing break under the warming rays of the sun, while also enjoying a breath of fresh air. The home is a nature lover's paradise with so much greenery adding to the style and architecture. 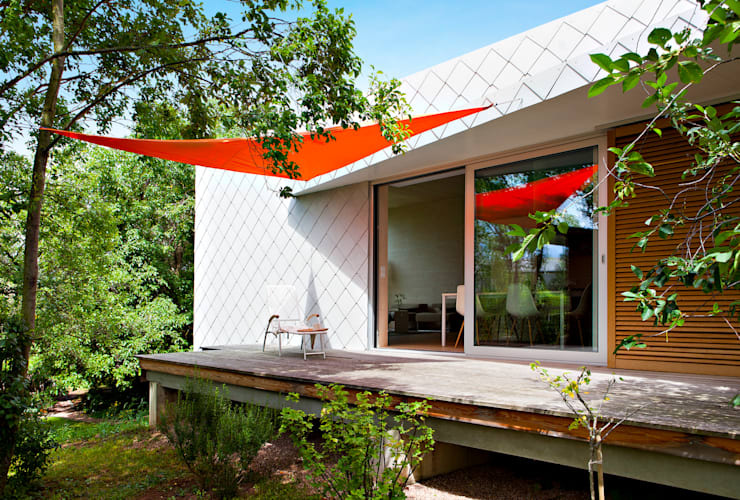 The main façade of this home is simple and attractive, the walls are protected from rain and wind through the use of cement fibres, which add a decorative aspect to the design as well. 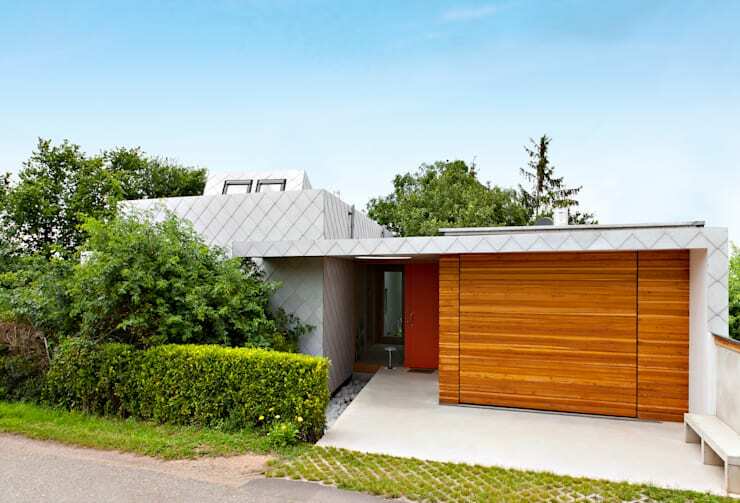 The red wood garage door adds warmth and style to the exterior that also contrasts directly with the grey cement. 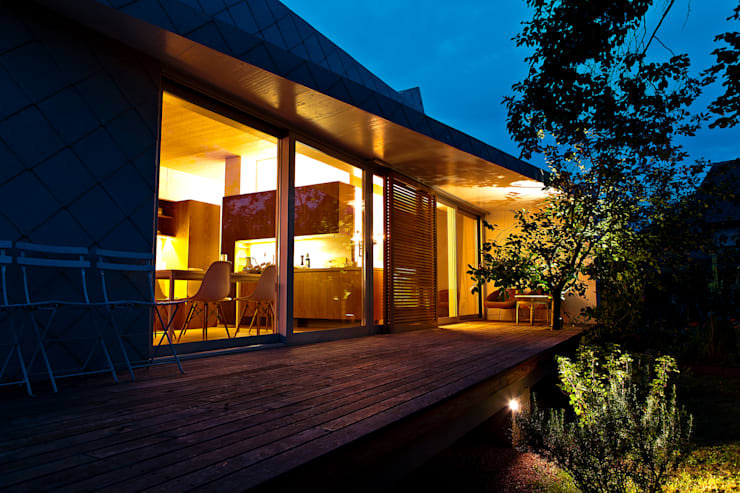 The greenery is overwhelming and again provides a nature loving aspect to this modern home. This must be the most striking feature of this elegant and contemporary home. The interior and exterior share a transparent façade that is functional and convenient, creating an evolving yet picturesque scenery that is aesthetically attractive from all angles too. The interior designers implemented an idea simple furnishing in this comfortable room is great, the decision was not to overshadow the landscape with too much decor… an aspect that has been taken care of perfectly. The open plan living, dining room and kitchen along with the fireplace adds to the stylish appeal of the area, it is undeniably modest yet contemporary in design too. Lazing around and admiring the view has never been so stylish. Lighter colours form the basis of design in this modern home and the light shade used for wooden ceiling and floor is impressively stylish in every way. Although the kitchen cabinets are darker in tone, the colour adds a welcoming warmth to the design. The use of natural hues has been perfectly utilised in this space too, with an all-white dining table being the hub of social activity. Accentuating the warmth of this home is the comfortable and cosy fireplace, situated in the centre of the space… a must have during winter. We have come to the end of this Ideabook, but the beauty and style of this home should be appreciated as being a combination of perfectly detailed charm, and attractive materials that enhance the cosy atmosphere of this modern home. 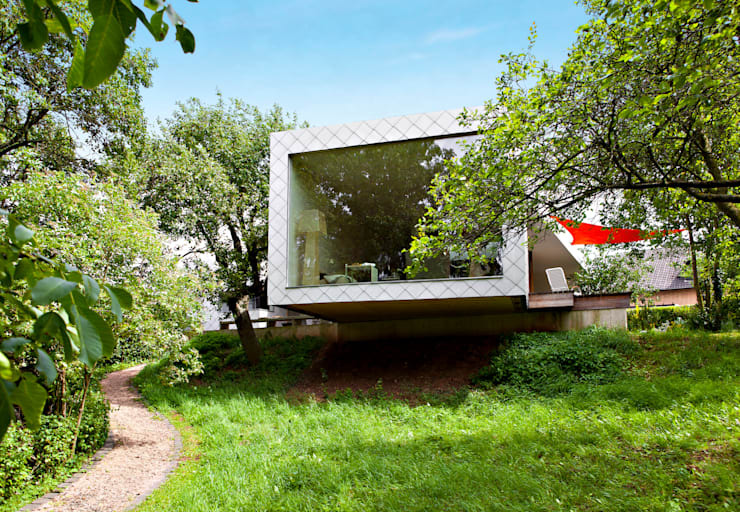 If you liked this beautiful and simple home, then The Pretty Prefab Home is an excellent read too! 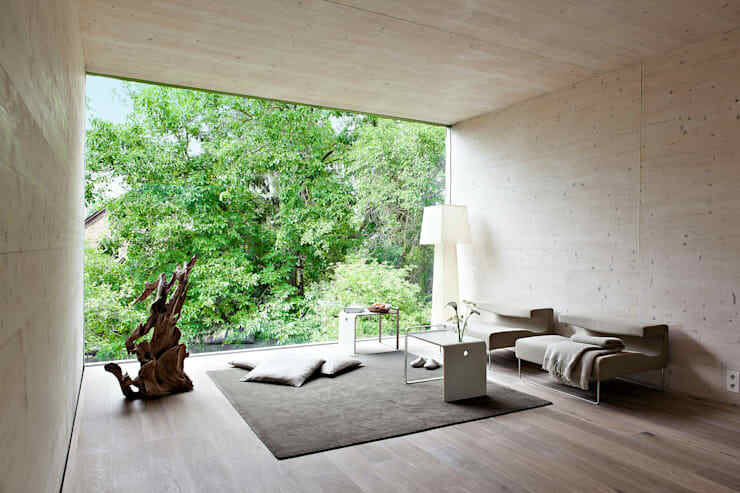 A home with a view of nature, what do you think?